Today is Independence Day in the USA, so I didn't have to get up early to work. Craig and I slept in, but Tyson was up bright and early to hike Volcan San Pedro with Humberto and his nephew Juan Carlos. They took a lancha to San Pedro la Laguna, and then took a tuk-tuk to the starting point for the hike. Craig and I had done this hike when we first met Humberto in 2004. It is a tough hike in the high altitude, steep and often exposed to the hot sun. 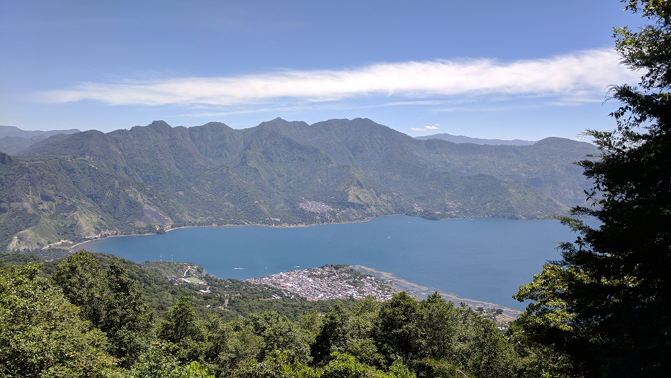 I hadn't been able to complete the hike, and opted instead to wait at the mirador (lookout). Craig did make it to the summit, but called the hike "punishing and relentless." I actually waited at the mirador for 5 hours for them to return. When Tyson expressed interest in the hike, we were encouraging, but we had no desire to repeat the experience ourselves. While they climbed, we had a nice breakfast of pancakes, coffee, juice, and fresh fruit with the family. We gave Ian a small wooden garbage truck which he enjoyed, and he integrated it into his Duplo airport. I logged into work and caught up on some things. For lunch, we had spaghetti in an eggplant meat sauce. It was delicious. Around that time, we got a text from Tyson saying that they had not made it to the summit of San Pedro. He was hot and exhausted and only had half a bottle of water left when they were still 40 minutes from the top. So they decided to turn around and were on their way home. They had, however, had some gorgeous views of the lake from the mirador. Tyson had enjoyed inspecting all of the plants. There had also been a cool rope swing where Tyson had swung out over a steep drop off, again with a gorgeous view of the lake and surrounding volcanoes. After lunch, Aracely went to her typing class and Eddy went to his guitar lesson. Craig noticed two red patches on his skin, which we attributed to some kind of skin reaction to the sulfur water at the hot spring bath yesterday. Tyson returned, disappointed he hadn't made it to the summit. Craig asked if that was motivation to try again on a subsequent trip, but Tyson was adamant that he never wanted to see that volcano again. We feel the same way, 14 years after our original attempt. Tonight, the whole family went for dinner at Paulina's sister Isabela's restaurant. In past years, the restaurant had been located on Rancho Grande, just around the corner from the house. But she had recently moved to a new location, on the second floor of a building closer to the lake. The space was very nice, with much more room. It was a good thing, because we were a party of 18 (Tyson, Craig, myself, Humberto, Paulina, the 7 kids, Paola's boyfriend Cristian, Vanesa's boyfriend Dany, Humberto's nephew Juan Carlos, his wife Yolanda, and their kids Junior and Fatima). Paulina had told her tghat we were all coming, abd Isabela had called in her whole family to help cook for our huge party. This included her daughter Lety and Lety's daughter Nidia. Lety's younger kids were playing outside on the porch, and Ian Ivan joined them. Craig was finally feeling well enough to have some alcohol, and he and the guys ordered beer. When we saw that Paulina and Humberto were having shot of tequila, Tyson, Craig, and I wanted in on that as well. We enjoyed a couple of rounds. The kids ordered strawberry licuados (milkshakes). They were so refreshing. Yasmin finished her milkshake quickly and slapped her hands on the table. "Otra!" (another), I called. "Verdad?" (Really?) Yasmin asked. I insisted. Everyone was in a very happy mood, and we shared many laughs. There was a video jukebox on the far wall, and for some reason it was showing videos of pole dancing. We all got a good laugh out of that and the kids were embarrassed. We ordered the house special: chicken tacos and papas fritas (Isabela makes the best home-made fries we have ever had!) Some of the kids got hamburgers, which are piled high with all kinds of condiments including a fried egg. It was all so delicious, and as people finished, we ordered even more. More tacos. More fries. More drinks. We all ate to bursting. Tyson entertained Paola by using the napkin caddies (as well as boxes of Tic Tacs) as castanets. She and Yasmin were very amused by him. Toward the end of the meal, Juan Carlos, Yolanda, Vanesa, and Dany drank Quetzalteca aguardiente liquor. We had never tried it before, even though it played an integral role in various Mayan traditions. So Craig, Tyson, and I split two bottles: one tamarind flavor and one mora (blackberry) flavored. It was quite good. We had a wonderful time, with so much camaraderie! 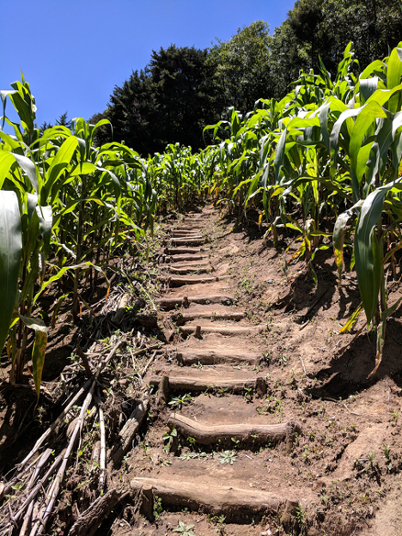 We could have stayed all night, but Tyson was exahusted after his volcano ordeal (according to his FitBit, he had walked 13.7 miles today), and we would all need to get up early tomorrow morning to visit the Mayan ruins of Iximche. It took Lety and Isabela quite a while to figure out our bill. There had been so many drinks, meals, extra orders of fries...we settled up and said our thank yous and goodnights. It had been an absolutely lovely evening.